Have you noticed that colorful depictions of Indian gods and goddesses have made their way into the Western yoga scene, but are unsure how they can be useful in your personal practice? This book by a long-time yoga practitioner and scholar of religion provides an answer. It shows you how to use the physical postures of yoga along with deeply symbolic imagery for reflection, self-examination, and healing. 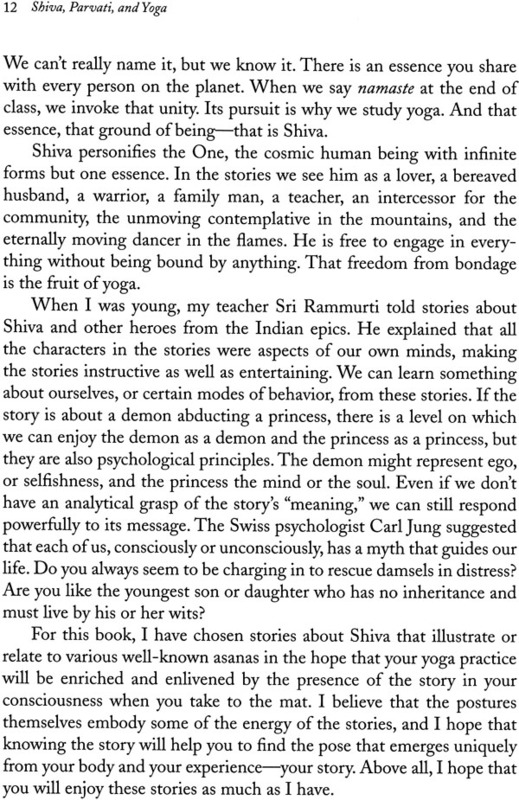 When I was young, my teacher told stories about Shiva and other heroes from the Indian epics. He explained that all the characters in the stories were aspects of our own minds, making the stories instructive as well as entertaining. 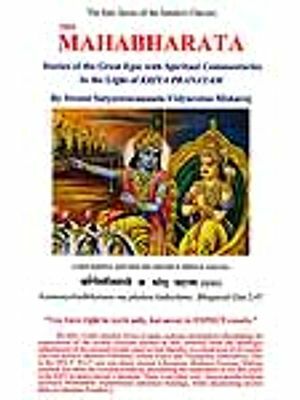 For this book, I have chosen stories about Shiva related to well-known asanas in the hope that your yoga practice will be enriched and enlivened. I believe the postures themselves embody the energy of these stories, and I hope that knowing the stories behind them will help you to find the pose that emerges uniquely from your own body and from your own experience of yoga. There are many excellent books on how to do asana, but this is not one of them. This is a book about using asana and related images for reflection, self-examination, and healing. In it, I discuss the use of asana, mythology, and culturally resonant imagery as tools for deepening your yoga practice through observation of your body, your mind and your emotions. In the field of anthropology, symbolic healing refers to the deep structure that appears to underlie the universal experience of healing. This experience of ten occurs spontaneously in response to a particular myth or a psychologically true story. Individuals recognize, often of a very deep and non-intellectual level, that a particular story somehow "speaks" to their sense of suffering. Their emotions attach to symbols in the story; and experience resolution along with the characters in the story; they experience a healing transformation of a personal dilemma. Yoga philosophy takes it for granted that human life involves suffering, because we mistake the physical world and body for something of lasting spiritual value and significance. 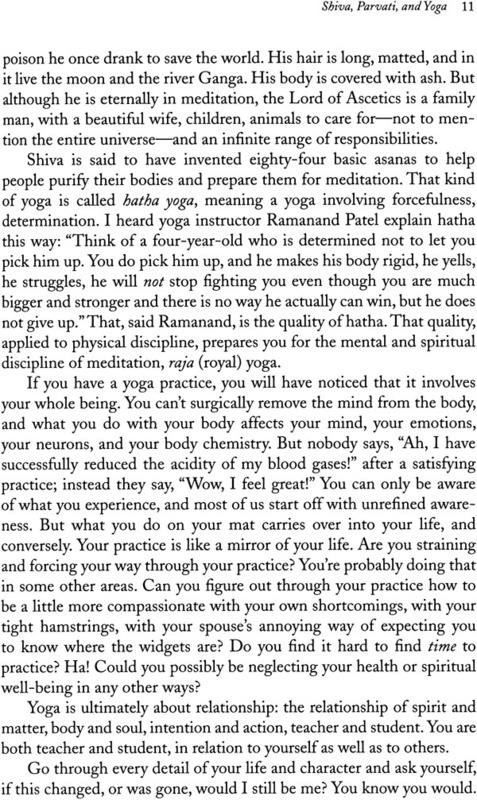 The practice of yoga, as explained by Patanjali (ca. 200 bce) in the Yoga sutra, is a process of dis-identifying with the body and things that change, and redirecting our sense of unity to the eternal and unchanging. Patanjali identifies svadhyaya, self-study, as one of three key techniques in his system of kriya yoga. Traditionally, svadhyaya means the "going over" (adhyayana) of sacred texts such as the Veda or treatises on spiritual liberation, as well as the repetition of purifying prayers, such as the sacred syllable Om. This going over in involves turning something over in the mind repeatedly, reciting something until it is memorized, and learning it by heart, becoming or embodying it. Clearly, this is different form studying something for information or reading about a subject. Michelangelo famously said that to sculpt a horse, he simply removed from the marble everything that was not the horse. In Patanjali's yoga, we have instructions on how to remove from consciousness everything that is not compatible with the enlightenment that is our natural state. We don't become someone else, someone enlightened; we become our most authentic self, which is to say, someone who is enlightenment itself, once our self-imposed belief in limitation are put into proper perspective. 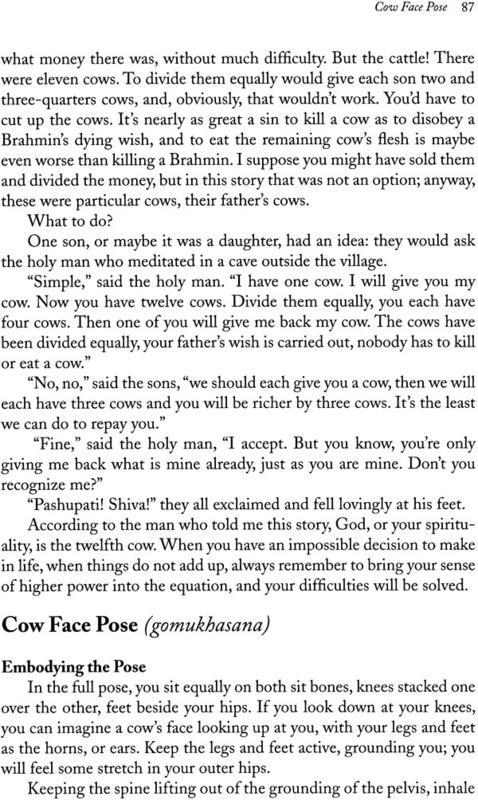 It seems to me that the process of svadhyaya, the repeated, devoted return to a sacred text or prayer until it sings in our veins, includes a process of discriminating the part that- if you'll forgive my mixed metaphors- is the horse from the part that is not the horse. The more fully we embody the sacred teaching, the more easily we see what has to change or be discarded to make room for what we are becoming. The third limb of Patanjali's yoga is asana, the physical dimension of yoga practice, and the one most familiar to Westerners. Through the practice of asana, we become increasingly conscious, not only of our physical bodies but also of our emotional and energetic dimensions. Asana is a mirror for self-awareness. But the asanas we practice are only the tip of an enormous cultural and spiritual iceberg. The tip- the physical postures and their effect on our muscles, bones, circulation, and respiration- is so engaging in itself that, as yoga has become increasingly popular in the West, we seem to have lost sight, or awareness, of what lies through which we can discover hidden facets of , and possibilities for, ourselves. Together, the pose, the story, and the artistic image enlarge the power and range of our self-understanding; and it's been my experience that engaging with the poses, stories, and images can elicit a powerful experience of symbolic healing. Physically, you need a true sense of where your body is misaligned if you are to correct it. In the beginning the teacher demonstrates the pose and, as the student, you try to reproduce what you see. But your body has its own habits, so familiar as to be unconscious. You are not aware that you carry your left shoulder higher than the right; to you they feel level. Your teacher, however, sees the discrepancy and brings it repeatedly to your attention until you learn to discern it for yourself and correct the imbalance that you now know to be there. You have begun to embody a specific teaching. You learn to rely on your heightened internal sense and not the correction of the external teacher. You have, you might say, begun to heal the imbalance that expressed itself in uneven shoulders. You come to feel, in a completely non-cognitive way, how the pose, the image of balance, expresses itself in you. 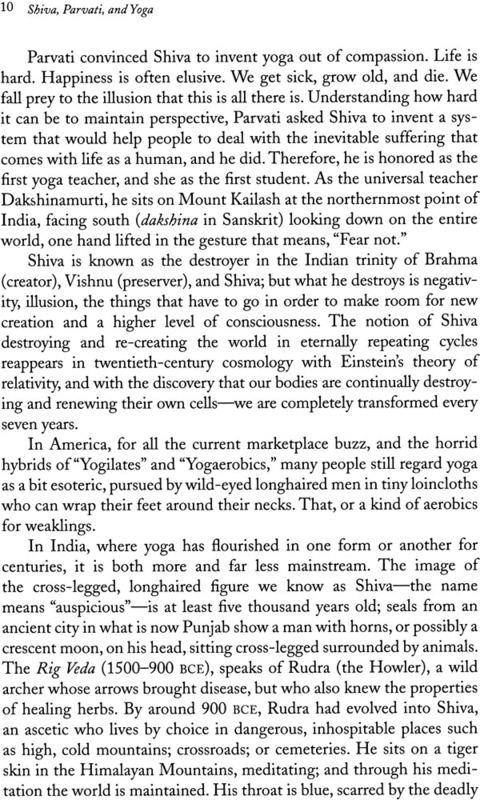 The asanas I have selected for this book are loosely organized around the central figure of Shiva, Lord of Yogis. Tradition says that Shiva created yoga at his wife Parvati's request, to help human being free themselves from suffering. Some asanas resonate directly with stories about Shiva and Parvati, others more to symbols, images, and attributes associated with India's sacred traditions. I think you will find a common theme of dealing with a puzzle or problem of human existence: suffering. The stories, characters, and images can affect us and transform us spiritually and emotionally, as the asanas affect us physically. Approach these stories repeatedly, devotedly. Through listening to the stories and thinking about them; through looking at the artistic representations of Shiva, Parvati, and their attributes; through performing the asanas in a contemplative spirit; and finally through the self-examination process of journaling, we discover both who we are at this moment- or rather, who we think we are- and the possibility of moving beyond that. Through dwelling on them, we begin to incorporate some of the divine attributes that we contemplate. We rise to a new level of freedom and integrity in our asana practice and find greater richness and meaning in our lives off the mat. Use this book in your personal practice, choosing a story, an asana, or an image to work with for the day, the weekend, or the week. Read the story. Practice the pose. Contemplate the image. Let them sink in and become part of you. You may choose to journal about the process. Write about the sensation in your hip, your breath, something the story brought up, something that seems to have nothing to do with this pose but that wants to come out. It's about seeing what is present in your consciousness, not about creating a finished piece for publication. Choose a limit for each piece of writing- three pages, or fifteen minutes- stopping only when you reach that limit. We all know the yoga maxim "As on the mat, so in life." If we are persistent, our asana practice can reveal not only which joints or muscles are in need of strengthening or realignment but also where we are impatient, lazy, unkind; and, let's hope, also where we are patient, dedicated, forgiving. The stories in this book offer opportunities to consider yourself against the background of stories that hold meaning for all people, for all time, and to "true your standard" against eternal values. When I was a child, I heard my guru tell stories about Shiva, Rama, Krishna, and their wives, friends and challenges. He would say that these stories and these people are alive right now, in us. As an adult I continue to derive tremendous joy and inspiration from yoga and from the art and mythology of India's sacred culture. The more I learn, the more I am surprised and delighted by new facets of the jewel that is yoga. I hope that my enthusiasm will be contagious and that you will find things in this book to surprise and delight you. The idea for this book was born at a week-long Relax and Renew teacher training held by Judith Lasater in Edmonton, Alberta. We were sharing observations of the way emotions have of coming up for various people in various poses, and how we as teachers could best respond when one student is obviously feeling something very deeply-sobbing, say- while all other members of the class serenely go on with their practice. One woman shared a story about being in a class where a man who was practicing a pose on the next mat seemed ready to explode with fury. His face got red, his breathing was labored, he looked (she thought) as if he'd like to murder someone; and she was, well, a tad uneasy at being in such close proximity to his rage. Nothing bad happened, but she hadn't been satisfied with the teacher's handling of the situation, and it was still on her mind. "What pose were you doing?" someone asked. "Virabhadrasana- warrior 2." "Wow!" I said, "Do you know who Virabhadra is?" Nobody did, or at least nobody else wanted to get up and share with he class. I told the story of Shiva's wedding, Daksha's sacrifice, and how the embodiment of rage and grief had been created rom one of Shiva's hairs. We all marveled at the coincidence, it you want to call it that, of this pose being the one in which her fellow student was overcome with rage. 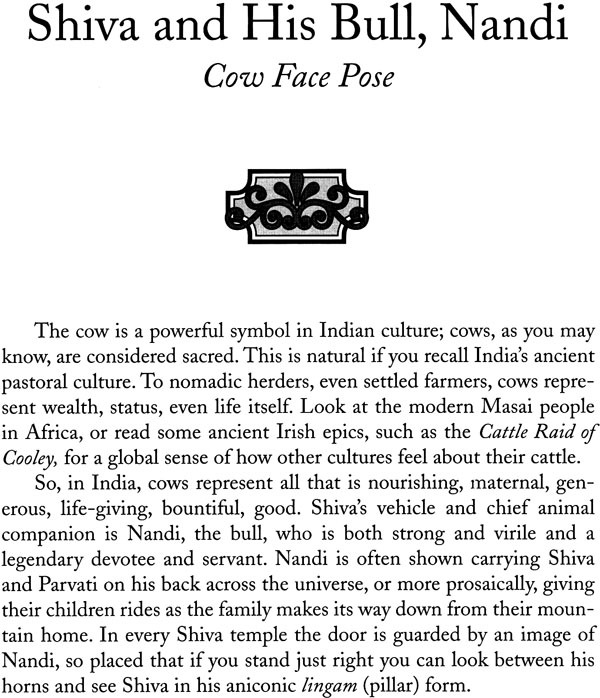 Later, someone asked me to recommend a book telling the stories behind the yoga poses. I couldn't think of a single title. After a second I realized there was no such book, and the idea for this book was born. 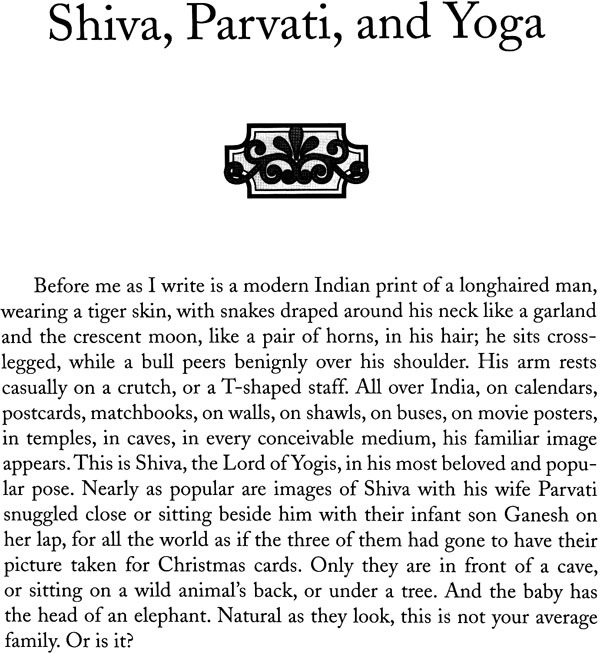 There are plenty of sources for tales from Indian mythology, and some modern yoga classics, such as the works of B.K.S. 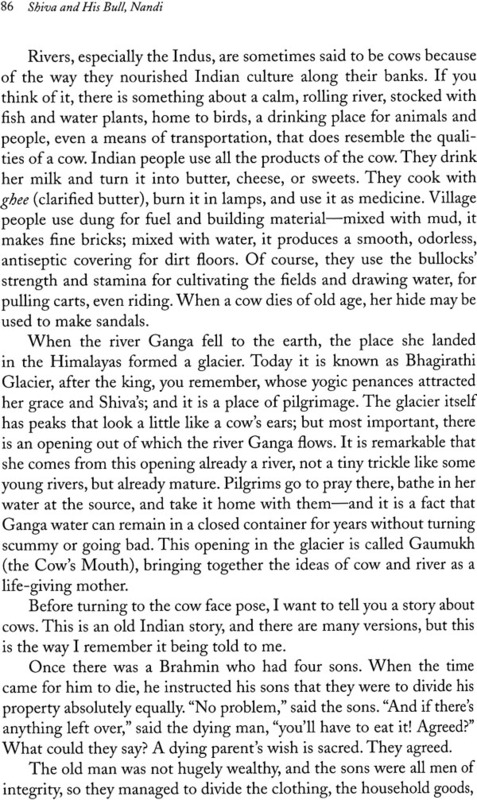 Iyengar, incorporate a few stories in discussions of the asanas. But you pretty much have to run across them by accident or else know what story you're looking for in order to find it. The yoga tradition is very rich and very old. It's also very Indian, and this poses something of a problem, or a challenge, to modern American students. I was introduced to yoga in 1964 when I was fourteen. That was the summer after President Kennedy was killed, the summer of the freedom riders who traveled to the American South in their effort to end segregation against African Americans. Timothy Leary had been kicked out of Harvard, but LSD was so uncommon that it wasn't yet illegal. The Beatles had not yet met the Maharishi. The war in Vietnam was barely mentioned. Ladies wore gloves and stockings with seams up the back. Personal cassette players were a thing of the future; transistor radios were state of the art. At my house, my grandmother had died, and my mother and I were engaged in mortal combat. She and I could not be under the same rooffor too lone without one of us (well, me) running into her room yelling, "I hate you!" and slamming the door. My father spent a lot of time off somewhere, working, and my brother was temporarily lost to me in a world of sports. I was too young to have a job, too young to do anything, I thought, and anyway I had no transportation. I did what many a teenage girl has done in similar circumstances: I declared myself an atheist, wrote poetry, and thought about death. They say that when the student is ready, the teacher appears. Mine appeared in the form of Dr. Rammurti S.Mishra and the community of the Ananda Ashram. Dr. Mishra was from India. He came from a family of meditators and Sanskritists, and he was then on staff at Bellevue, Manhattan's foremost public psychiatric hospital. He had developed a reputation in the medical community for being able to make progress with difficult, even hopeless-seeming, patients by the then-unheard-of measure of teaching them to meditate. One of this students acquired an old estate near Harriman, New York, and in the summer of 1964 it was getting ready to open its doors as an ashram, a place where people could come to study meditation, Sanskrit, and Yoga. Dr. Mishra's book fundamentals of yoga had received some attention, and his lectures were popular in the city. He would work all week at Bellevue and travel to Harriman on weekends; meanwhile, a small core of his serious students and some ambiguous people with no visible means of support would stay on the property to develop it. My parents were interested. They were Quakers and familiar with meditation. Krishnamurti and Mahatma Gandhi were two of my father's heroes. My parents attended a couple of meditation programs at Ananda but found themselves defeated by the length of the programs and the impenetrability of Dr. Mishra's accent. "I couldn't understand a word he said!" my mother complained later. However, they met a nice young man who was living there, who wanted to make some money giving guitar lessons. Just the thing for their sulky daughter! I did learn to play a few chords from max, and before long my relieved mother was dropping me off at the ashram in the morning and picking me up in time for supper. My hanging around all day was justified by the semi-fiction that I was helping look after the younger children of a few of the residents. I no longer recall an particular moment of meeting Dr. Mishra. I do recall his telling me that ashram meant a "refuge," and ananda meant "joy"- joyous refuge-and the ashram was that for me. I took to meditation as though to my natural element, and to the sporadic yoga classes with glee. I was a flexible kid, and Doctorji's method of teaching asana to children was to show us a pose and say invitingly, "Can you do this?" I trusted him completely. If he suggested that I could do it, I felt that surely I could, so I was ever afraid to try anything. As he taught, he told stories about the poses and the ancient yogis who discovered them. He contended that we already knew everything we needed-all the Veda. "Feel it!" he said over and over. "It is your true nature." "But what if I don't feel it?" "It is maya!" he said promptly. Maya was the principle of illusion that tricked us into believing we were something other than eternal, imperishable- the same as God. "Omnipotent, omnipresent, omniscient," he would intone, my first adjectives for divinity. "Thou art that!" Some of the older and more serious meditators viewed me as intrusive, and I can see now that I must have been. My mother would drop me off when it worked for her, and the ashram's schedule was flexible at best. Programs lasted for hours, a mix of Sanskrit chanting, lecture, and meditation; as often as not, I burst cheerfully into the middle of something and rushed over to hug Doctorji, whom I regarded as my particular friend. He always hugged back, and then said, "Now go sit down," which I would do, beaming, stepping carefully through the seated meditators as they glared at me, or smiled back, depending on how they felt about children. Fourteen is such a vulnerable age. More than anything in my life right then, I needed an adult to tell me that in my inmost, realest nature I was valuable, eternal, already possessed of all the wisdom of the ages. I needed a tool to help me deal with my mother's sorrow, my father's absences, my feeling of being from another planet- and meditation gave me that. As I understood it, sitting in meditation and moving in meditation- asana- were just different aspects of the same process. "Like matter," said Doctorji, "sometimes a point, sometimes a wave." He also taught us to chant, the feel of the Sanskrit syllables rolling in the mouth and throat like grapes: om nama shivaya, or just Om. "It is all you will ever need," he instructed. "Om contains the vibrations of all consciousness. Om will protect your mind. Om is God himself."